Yulara takes its name from the local Aboriginal words for "howling" and "dingoes," which conveys the town's isolated location in the Outback. You'll find plenty of places to visit near Yulara: Uluru-Kata Tjuta National Park (Walpa Gorge, Kata Tjuta, & more). 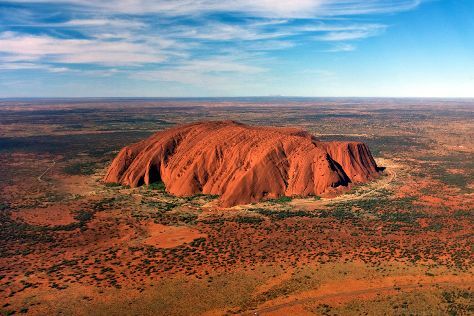 And it doesn't end there: explore the striking landscape at Uluru, browse the exhibits of Wintjiri Arts + Museum, stroll through Uluru Hiking Path, and take in the pleasant sights at Lungkata Walk. To see maps, reviews, traveler tips, and more tourist information, read our Yulara day trip planning site . Sydney to Yulara is an approximately 5.5-hour flight. You can also drive. Traveling from Sydney in August, you will find days in Yulara are a bit warmer (27°C), and nights are a bit cooler (6°C). You will leave for Batchelor on the 17th (Sat). 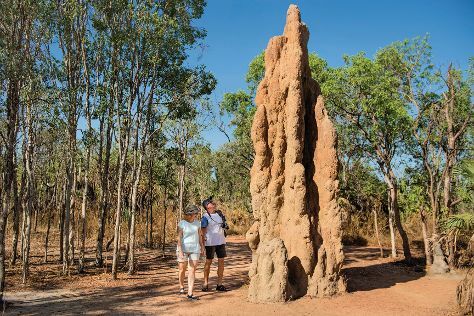 You'll find plenty of places to visit near Batchelor: Litchfield National Park (Florence Falls, Buley Rockhole, & more) and Mary River National Park (in Mary River National Park). Spend the 18th (Sun) exploring nature at Litchfield National Park. To see other places to visit, where to stay, more things to do, and other tourist information, go to the Batchelor travel route builder site . The Route module can help you plan travel from Yulara to Batchelor. When traveling from Yulara in August, plan for somewhat warmer days and warmer nights in Batchelor: temperatures range from 37°C by day to 22°C at night. Wrap up your sightseeing on the 22nd (Thu) to allow time to travel to Darwin. Go for a jaunt from Darwin to Berry Springs to see Territory Wildlife Park about 42 minutes away. Spend the 23rd (Fri) wandering through the wild on a nature and wildlife tour. Plan for a day of cool, family-friendly fun on the 28th (Wed) at Darwin Waterfront. There's much more to do: enjoy the sand and surf at Mindil Beach, look for all kinds of wild species at Crocosaurus Cove, get engrossed in the history at Darwin Aviation Museum, and examine the collection at Defence of Darwin Experience. To see photos, traveler tips, ratings, and more tourist information, go to the Darwin trip planner . Drive from Batchelor to Darwin in 1.5 hours. In August, daily temperatures in Darwin can reach 37°C, while at night they dip to 22°C. Wrap up your sightseeing on the 3rd (Tue) to allow time to travel back home.